The gas (and ice) giant known as Uranus is a fascinating place. The seventh planet from out Sun, Uranus is the third-largest in terms of size, the fourth-largest in terms of mass, and one of the least dense objects in our Solar System. And interestingly enough, it is the only planet in the Solar System that takes it name from Greek (rather than Roman) mythology. But these basic facts really only begin to scratch the surface. When you get right down to it, Uranus is chock full of interesting and surprising details – from its many moons, to its ring system, and the composition of its aqua atmosphere. Here are just ten things about this gas/ice giant, and we guarantee that at least one of them will surprise you. Uranus is the seventh planet from the Sun, orbiting at a distance of 2.88 billion km. But it’s still much closer than Neptune, which averages a distance of 4.5 billion km from the Sun. However, this does not prevent Uranus from being colder than Neptune. Whereas the former experiences an average temperature of 72 K (-201 °C/-330 °F), reaching a low of 55 K (-218 °C/-360 °F). 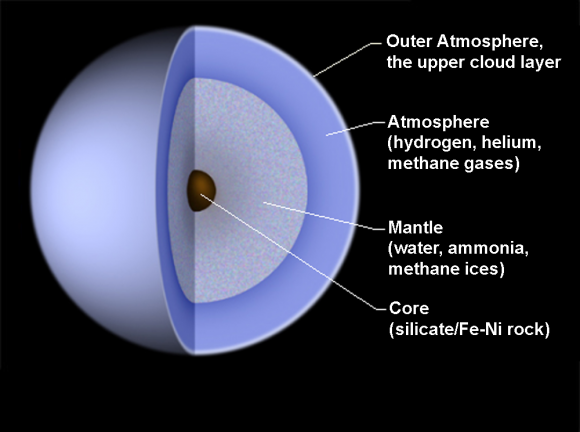 In contrast, the temperatures at the cloud tops on Uranus (which is defined as “surface temperature” for gas giants) averages 76 K (-197.2 °C/-323 °F), but can dip as low as 47 K (-226 °C/-375 °F). This is due to the fact that, unlike the other large planets in the Solar System, Uranus actually gives off less heat than it absorbs from the Sun. While the other large planets have tremendously hot cores, which radiate infrared radiation, Uranus’ core cooled down to the point that it no longer radiates much energy. All of the planets in the Solar System rotate on their axis, with a tilt that’s similar to the Sun. In many cases, planet’s have an axial tilt, where one of their poles will be inclined slightly towards the Sun. For example, the axis of the Earth’s rotation is tilted 23.5-degrees away from the Sun’s plane. Mars is similar, with a tilt of about 24 degrees, which results in seasonal changes on both planets. A sidereal day on Uranus (that is, the time it takes for the planet to complete a single oration on its axis) is only about 17 hours long. But the tilt of Uranus is so pronounced that one pole or the other is usually pointed towards the Sun. This means that a day at the north pole of Uranus lasts half of a Uranian year – 84 Earth years. So, if you could stand on the north pole of Uranus, you would see the Sun rise in the sky and circle around for 42 years. By the end of this long, drawn-out “summer”, the Sun would finally dip down below the horizon. This would be followed by 42 years of darkness, otherwise known as a single “winter” season on Uranus. The least dense planet in the Solar System is Saturn. In fact, with a mean density of 0.687 g/cm3, Saturn’s body is actually less dense than water (1 g/cm³). This means that the planet would float in a pool, provided it were roughly 60,000 km wide. With a mean density of 1.27 g/cm3, Uranus has the second-lowest density of any planet in the Solar System. This low density has an interesting side effect. Despite the fact that Uranus is 14.5 times as massive as the Earth, its significantly lower density means that you would only experience about 89% the force of gravity, assuming you could stand on Uranus’ cloud tops. When it comes to ring systems, Saturn’s are the most famous. In addition to be colorful and far-reaching, they are also highly visible. One could spot them using nothing more than a backyard telescope. But in truth, all the gas and ice giants have their own ring systems, and Uranus’ is the second most dramatic set of rings in the Solar System. However, these rings are composed of extremely dark particles which vary in size from micrometers to a fraction of a meter – hence why they are not nearly as discernible as Saturn’s. Thirteen distinct rings are presently known, the brightest being the epsilon ring. And with the exception of two very narrow ones, these rings usually measure a few kilometers in width. Compared to Jupiter and Uranus, Neptune seems quite… normal. When one looks at the swirling clouds and eddies that stream across the surface of Jupiter and Saturn, the violent and turbulent nature of their atmospheres is made clear. Uranus, by contrast, appears as a light and uniform blue. But thanks to improved instruments that can examine planets through other wavelengths (i.e. infrared) and the flyby conducted by the Voyager 2 spacecraft, some significant things become apparent. For example, Uranus has powerful zonal winds within its atmosphere that can reach up to 250 m/s (900 km/h, 560 mph), and can generate anticyclonic storms like Jupiter’s Great Red Spot (known as the “Dark Spot“). It also has cloud patterns that differ between hemispheres, some of which last for mere hours while others can persist for years or decades. But perhaps most interesting is the presence of certain “ices” in Uranus’ atmosphere. The third-most-abundant component of Uranus’s atmosphere is methane (CH), which is what accounts for Uranus’ aquamarine color. There are also trace amounts of other hydrocarbons, such as ethane, acetylene, methylacetylene, and diacetelyne – all of which are believed to be the result of methane interacting with solar ultraviolent radiation (aka. photolysis). And last, there are confirmed traces of water, ammonia, carbon dioxide, carbon monoxide, and hydrogen sulfide within the layers of Uranus’ atmosphere. And due to the extreme cold, they are suspended in an icy state (hence the term “ice giant”). Like all of the giant planets, Uranus has its share of moons. At present, astronomers have confirmed the existence of 27 natural satellites. But for the most part, these moons are small and irregular.If you were to add up all of their masses, they would still be less than the half the mass of Triton, Neptune’s largest moon. However, unlike Triton, Uranus’ larger moons are all believed to have formed from an accretion disk that surrounded the planet, rather than being captured objects. The largest moons of Uranus are, in order of size, Miranda, Ariel, Umbriel, Oberon and Titania. These moons range in diameter and mass from 472 km and 6.7 × 1019 kg for Miranda to 1578 km and 3.5 × 1021 kg for Titania. Each of these moons is particularly dark, with low bond and geometric albedos. Ariel is the brightest while Umbriel is the darkest. Each one is comprised of roughly equal amounts of rock and ice, except for Miranda which is made primarily of ice, which may include ammonia and carbon dioxide, while the rocky material is believed to be composed of carbonaceous material. Their compositions are believed to be differentiated, with an icy mantle surrounding a rocky core. In the case of Titania and Oberon, it is believed that liquid water oceans may exist at the core/mantle boundary. The rest of Uranus’ moons, which are either situated within the orbit of Miranda or beyond Oberon, are all connected to Uranus’ ring system, which probably resulted from the fragmentation of one or several small inner moons. All of them are composed of ices contaminated with a dark material, which are most likely organic compounds darkened by exposure to UV radiation. Most of the planets are visible to the unaided eye, and were known in ancient times. 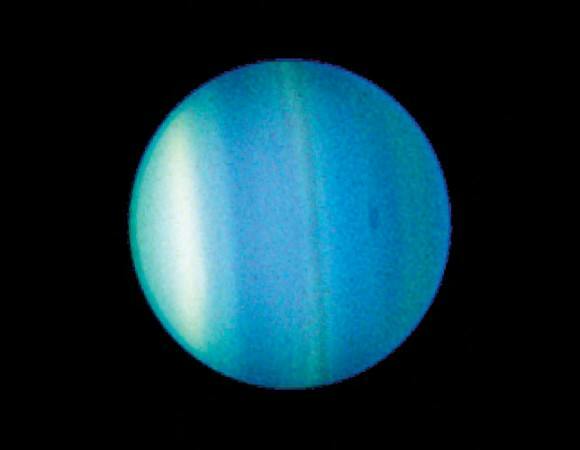 Uranus was the first planet discovered after the invention of the telescope. It was first recorded in 1690 by John Flamsteed, who thought it was a star in the constellation Tauri. But it wasn’t until Sir William Herschel made his observations in 1781 that astronomers finally realized it was a planet. Herschel originally wanted to call Uranus “George’s Star” after King George III of England. However, this was not a popular name outside of England. Eventually, the astronomical community officially settled on the name Uranus – the Latinized version of the Greek god of the sky, Ouranos – and the name stuck. You might be surprised to know that you can see Uranus without a telescope. At magnitude 5.3, Uranus is just within the brightness scale that a human eye can perceive. Unfortunately, you’d need to make sure that the night sky was extremely dark (i.e. no light pollution), and would have to know exactly where to look. Because of this, Uranus has actually been spotted many times in the past by ancient and pre-modern astronomers. But given its low luminosity compared to the other planets, it was generally mistaken for a star. In fact, when Flamsteed first observed it, he cataloged it as 34 Tauri, believing it to be a star in the Taurus constellation. Only one spacecraft in the history of spaceflight has ever made a close approach to Uranus. NASA’s Voyager 2 conducted its closest approach to Uranus on January 24th, 1986, passing within 81,000 km of the cloud tops of Uranus. It took thousands of photographs of the gas/ice giant and its moons before speeding off towards its next target: Neptune. No other spacecraft have ever been sent towards Uranus, and there are currently no plans to send any more. The possibility of sending the Cassini spacecraft from Saturn to Uranus was evaluated during a mission extension planning phase in 2009. However, this never came to fruition, as it would have taken about twenty years for Cassini to get to the Uranian system after departing Saturn. While several proposals are currently under consideration, none have been confirmed yet. 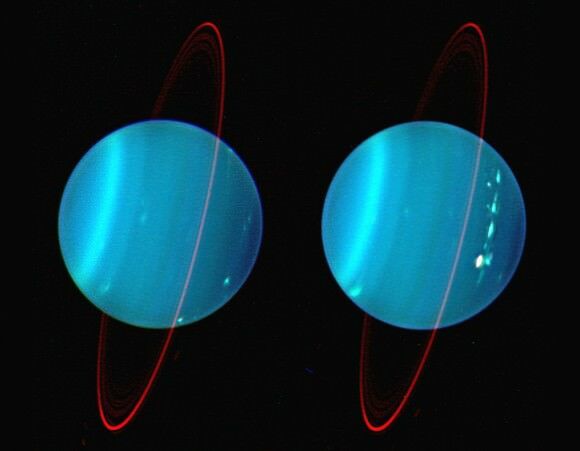 We have written many interesting articles about Uranus here at Universe Today. Here’s one about the Tilt of Uranus, the Atmosphere of Uranus, The Rings of Uranus, and How Many Moons Does Uranus Have? Previous PostPrevious Will the Mars Science Laboratory Be Cut?